This professional radioactivity meter is a precise instrument to measure Alpha, Beta and Gamma radioactivity. The radioactivity meter has a wide measuring range and can be used for diverse measurement types as well as for sporadic measurements in situ, long-lasting measurements or for controls. The radioactivity meter provides a certified measurement of the environmental radiation as well as of the radiation which is artificially increased up to 500 times over the limit value. This radioactivity meter has diverse applications. This Geiger meter is usually used in nuclear power stations. It is most commonly used in the control of imported goods, as well as to measure food which has been previously irradiated. This radioactivity meter can also be used to measure natural radioactive radiation such as the radiation which appears near the sea. It fulfills all the requirements when controlling building materials. In our online offer, there are two versions of this measuring instrument available: the standard version (GS1 model) or with acoustic signals (Ticker) (GS2 model). Radiation values can be recorded in the radioactivity meter memory or they can be transferred to a computer to be valued by means of a device included in the delivery (software and RS 232 data cable). If there are any questions about this radioactivity meter GAMMA - SCOUT, please have a look at the technical specification below or call: UK customers +44(0) 23 809 870 30 / US customers +1-410-387-7703. Our engineers and technicians will gladly advise you regarding the radioactivity meters or any other products in terms of regulation and control, or scales and balances of PCE Instruments. Antoine-Henri Becquerel discovered in the 19th century, that atomic units of uranium eradiate spontaneously (i.e. without any external influence) invisible radiation. For example the decay of radium under radiation. The instable nucleus of the radioactive radium isotope (consisting of 88 protons and 138 nucleoli) has a the constant attempt to obtain a more stable state. Thus the radium nucleus emits an alpha particle, that is equivalent to a helium core, consisting of two protons and two neutrons. This emission appears as alpha radiation. Which unit is common for radiation protection? We do not have any sensory organ to perceive radiation, so that a device is required to detect radiation, and measure its effect on the environment. Therefore a knowledge on radiation and its effects on the human body is required as well. Thus e.g. measuring only radioactivity is not enough to comprehend its biological effects and dangers. Further information you can find following the link from the German radiation protection committee SSK. 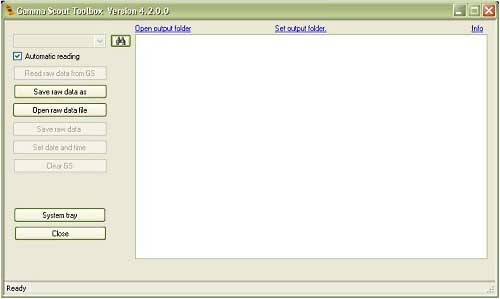 The software is used to transfer radiation values which are recorded in the meter to a PC or a computer. Measuring data can also be transferred to other calculation programs such as Excel to be valued (see above the possibilities to download it). LCD display with 4 positions, numeric, with quasi-logarithmic denomination and representation and indication of functions. yes, in the delivery a quality certification is included for every numbered meter. 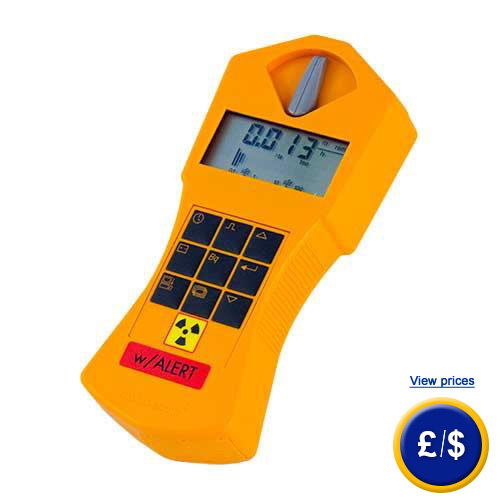 1 x radioactivity meter (GS1 model or GS2 model with acoustic signal), software, 1 x data cable, 1 x battery and user's manual.